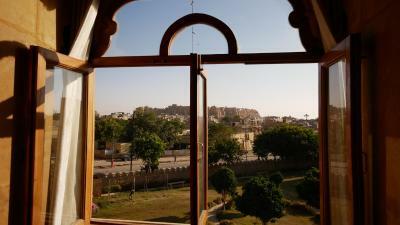 Lock in a great price for Gaji Hotel jaisalmer – rated 9 by recent guests! We truly enjoyed our time at Gaji Hotel, the staff went above and beyond on everything. We had originally booked for two consecutive nights but ended up coming a day earlier, not only did the staff accommodate that but gave us a pickup shuttle from the train station. After talking about desert tours with the staff we decided it would be best to leave on our original day of booking for the tour and return for one more night and they accommodated this as well by still only charging us for the two original booking days. The food was great, the view from the roof was beautiful, and the room was comfortable, and the desert safari was incredible! Thank you for everything, we couldn't recommend staying here enough! The staffs were very helpful and overall facilities were good. Loved it. This hotel is perfect for someone who is looking for a hotel to stay for few days in Jaisalmer. Good view, friendly people n testy food. And best of all its budget friendly. One of our best accomodations! The rooms are very nice and clean (with delightful smell!) Great value for money, Walking distance to Jaisalmer Fort, Gaji’s restaurant on the rooftop is wonderful too, Ali and all the staff are very kind, super friendly, and willing to help you for everything! Absolutely recommended! Ali, and all the staff was very nice and helpful all the time, we had room service and the food was nice and not pricey. We did also the Khuri safari with them and it was well organised and at a better price that with other companies. Very nice people, warm, and they do not try to trick you constantly like in so many otjer places. The best experience we've had in India (and more than that) ! The hotel is beautiful, the building is ornate and looks like a piece of art, it is wonderfully decorated inside. Our room had a beautiful view of the fort and the city. The staff are the best ever !! They are super friendly and helpful, but not pushy or trying to sell you some additional service, or anything like that (I'm mentioning this because we've experienced a lot of those things with other properties in India, so I was so super pleasantly surprised by the kind of treatment we received at Gaji hotel ). We felt very welcome, were assisted with whatever we needed, were picked up from the train station and dropped off after checking out . I loved everything about this property! Thank you! The host is very very kind, willing to help guests, and really loved the welcome tea. Nice rooftop view of the city, the taste of the food was just awesome. Gaji Hotel jaisalmer This rating is a reflection of how the property compares to the industry standard when it comes to price, facilities and services available. It's based on a self-evaluation by the property. Use this rating to help choose your stay! Set in Jaisalmer in the Rajasthan Region, 2,300 feet from Jaisalmer Fort, Gaji Hotel Jaisalmer features a sun terrace and views of the mountains. Guests can enjoy the on-site restaurant. Free WiFi is provided throughout the property and free private parking is available on site. The rooms are fitted with a TV. Some rooms feature a seating area where you can relax. A terrace or balcony are featured in certain rooms. The rooms include a private bathroom equipped with a bath or shower. The hotel also offers bike hire. Patwon Ki Haveli is 1,300 feet from Gaji Hotel jaisalmer, while Lake Gadisar is 1 mi away. 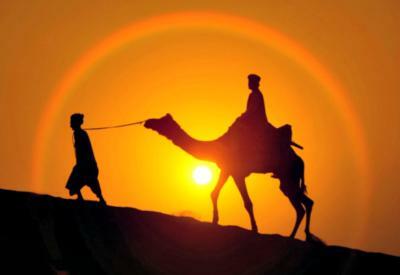 This is our guests' favorite part of Jaisalmer, according to independent reviews. This property is also rated for the best value in Jaisalmer! Guests are getting more for their money when compared to other properties in this city. 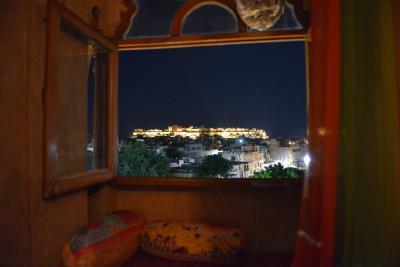 When would you like to stay at Gaji Hotel jaisalmer? Our hotel is located 1 km from bus station and 0.5 to 1 km to all sights in Jaisalmer. Hotel has well equipped rooms with all the amenities. There is rooftop restaurant with sunset point and amazing view of fort and city. House Rules Gaji Hotel jaisalmer takes special requests – add in the next step! Gaji Hotel jaisalmer accepts these cards and reserves the right to temporarily hold an amount prior to arrival. The A.C was not working in our room. We understand it's because of low power. It was a little uncomfortable but we survived. Amazing hospitality by the staff. We arrived by train in the middle of the night and they arranged a tuk-tuk to fetch us from the station. Ali, the front desk staff greeted us in the morning and gave useful information about Jaisalmer. We booked a non-touristic desert tour with them and had a great time! From the jeep ride to the camel (the camels look well taken care of, to me personally that's a big plus) ride and meals cooked by our guide, Giraj. Everything was as we hoped it would be. I highly recommend taking the tour with them, it's far out with no one around, the best way to experience the desert. The rooftop restaurant serves good food, and to our surprise, they also serve Korean dishes. A nice break from Indian food if that's what you wish for. We liked everything about this place. Excellent staff, going above and beyond to help. They let us check-in early and they let us shower after checking out, when returning from desert. The rooms were fine. The tour to the desert was superb and good for the price. The food at the restaurant was also very nice. Bed is very comfortable. Restaruant is good for food and view, also including the price. Besides, the host is super helpful!!! Everything, manager was brilliant from start to finish, staff were all great. 5* Location with rooftop views to the fort and surrounding area. Offered free Tuk Tuk to the station on our last day. Would visit the hotel again. Great hotel! Comfy bed with clean sheets Friendly helpful staff Restuarant upstairs is great! We ate there everyday! Ali was so kind giving us a lot a good advices to discover the city. Good location for a comfortable price. The camel safari and night in the desert was well organized and a very nice experience. Highly recommended. Very nice hotel with beautiful interiors, neat, spacious and clean rooms, comfortable beds, great restaurat with a great view from the rooftop terrace and fantastic food. The hotel is very well located, just few minutes walk from the Fort and the staff is extremely friendly and helpful. I definitely recommend it! An excellent hotel, helpful staff, very clean and comfortable room. We can see the fort from he roof top view. The food from roof top restaurant is good. Gaji hotel staff is absolutely AMAZING, they treat you like family, always a nice smile and a good chat. They truly do try to accommodate you to their best. The restaurant on the rooftop has the best view of the fort and the food is really good as well as the service. Ali explained to us everything about Jaisalmer, what to do etc and he told us about the Camel safari in the desert. At first, I was a little bit sceptical about doing this type of activity but we finally decided to do it and it was the best thing we’ve done in Rajasthan! There are so many company offering this service but the one working with Gaji is just the best. A true experience in the desert, sleeping under the stars, cooking food, riding camel, chatting with knowledgable Abdul, just incredible! Abdul really took care of us and made us feel at home in the desert, we laughed so much and really enjoyed it! Do not hesitate! The value for money is very very good! Thank you Gaji Hotel for the Jaisalmer experience, you have truly understood what hospitality means! The hotel and room was in nice Rajastan stile. No balcony, but we had a good view over the castle from our room. It was perfact town to walk in, you could reach everything by foot. The hotel offered free pick up and even free drop at bus station. Amazing staff did everything possible to make our experience the best it could be. The only thing we didn't like was that capacity of boiler was too small, so you have to be fast with shower. But as we later realized during our trip in India, almost every 3-star hotel has small boilers. First of all, Gaji and all his stuff are very friendly, hospitable and helpful, which made our stay really feeling like home. Especially hospitable is cheerful Ali with his welcome drinks and patient thorough answers to any questions we came up with at any time of the day. The hotel itself is fabulously decorated in ethnic Rajasthani style, with paintings, marble floor and sandstone walls covered in delicate carvings. Our rooms with view to the town and the fort, although lacked that exquisite antique touch, still maintained the same authentic local atmosphere. There is a rooftop restaurant, which serves varieties of Indian and Korean dishes. 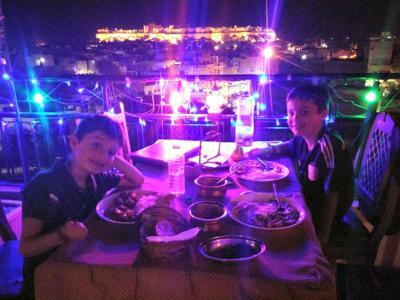 We didn't try anything Korean here, as we prefer to eat local meals, but Indian options were remarkably tasty and definitely worth the price, so it's a really good choice, especially if you want to save the time, while enjoying the panorama of Jaisalmer. Speaking of desert camel safari, Ali kindly organized an overnight under-the-stars tour (1500 Rs/pax) for us through their fellow operator, which involves local guides with camels. Or guide was very helpful and careful, camels were tall and beautiful, while the dunes were calm and mesmerizing. All in all, the tour is totally worth the price and our experience was the same as it was promised. The place for stay is really nice and the food was delicious. We were even offered a free stay in the desert camp after our trip to Desert National Park (see below), so we could rest couple of hours before camel safari. This camp is also a good option if for whatever reason you don't want to sleep under the stars, but for us this was the whole point. Guys at Gaji also organized for us the jeep with the driver to go to Desert National Park (approx 60 km; 1 hr; 4000 Rs roundtrip) as we wanted to see the great Indian bustard and other fauna.